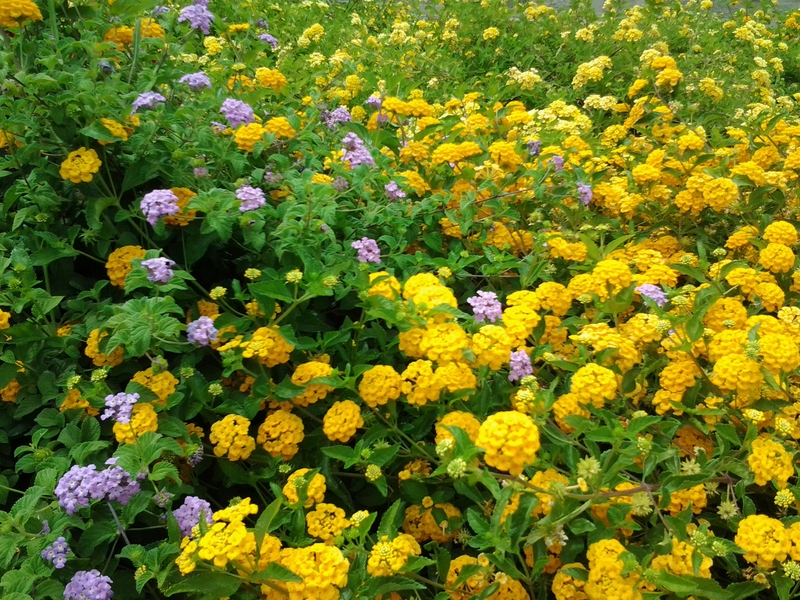 LANTANA is the best drought tolerant plant – Red, White, Purple, Gold, Perennial Flowers! As I was going to the store I came across one of the greatest displays of The New Gold, White, Red and even Purple Trailing Lantana I have ever seen! 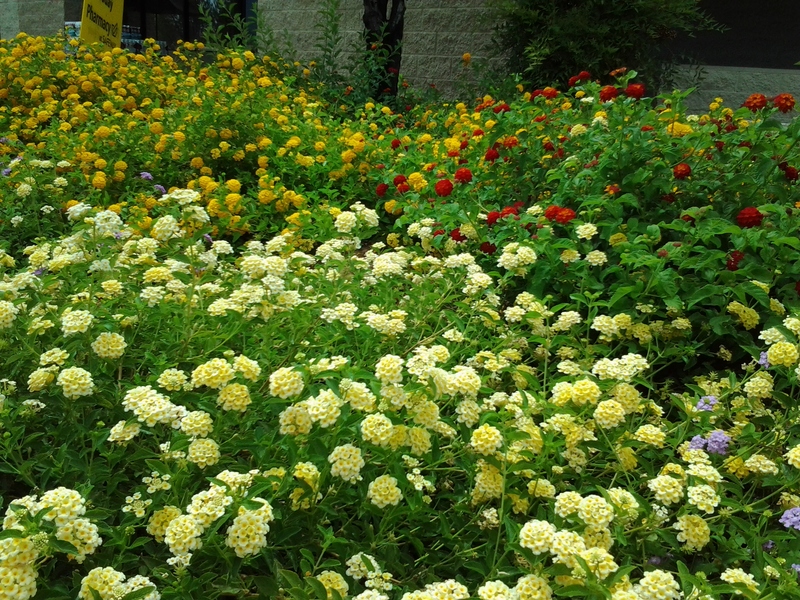 In our Arizona garden we have several species of Lantana because it is one of our desert favorites! 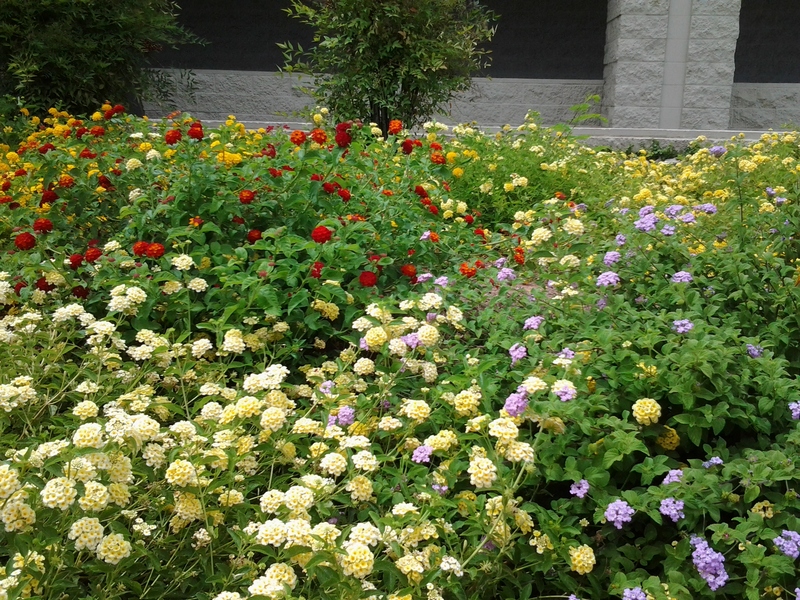 White, Red (Texas), Purple Trailing and Gold lantana mounds in this picture – Gorgeous! Lantana is a genus of about 150 species of perennial flowering plants in the VERBENA family, (Verbenaceae). They are native to tropical regions of Africa and here in the Americas. It comes in plants and shrubs commonly called Lantana and shrub verbenas. Some types are considered invasive; they spread easily because lantana leaves are somewhat poisonous to most animals. This is precisely why Lantana is a large part of our desert garden. Not only is Lantana resistant to the hot temperatures in Southern Arizona, but also drought tolerant and all the small animals leave them alone! Our dogs are not interested in our lantana plants or their poisonous leaves at all. The Purple Trailing Lantana looks beautiful dancing along side the Yellow New Gold and a lighter yellow lantana mound in the back. Being somewhat toxic and rejected by herbivores, camara and trailing lantanas are very hardy, but once or twice a year mine become infested with pests. Insecticidal soaps will damage this plant. Try using plain dish soap with water in a spray bottle. Although I did not see any berries in this orchestra of multi-colored lantana plants … the berries are edible ONLY when they are ripe. Though the stems of lantana are thin, the wood is very tough and durable and thus useful for crafts and wickerwork. 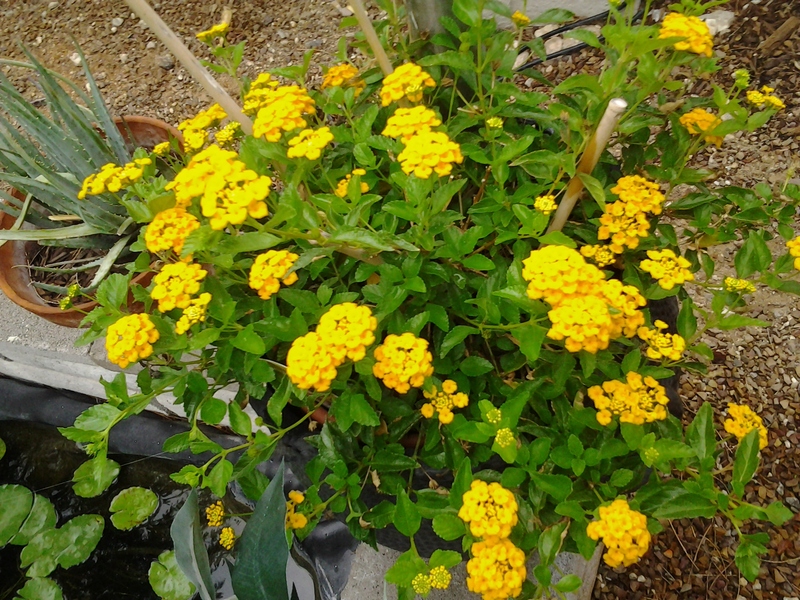 This is one heat resistant, hardy evergreen lantana shrub! 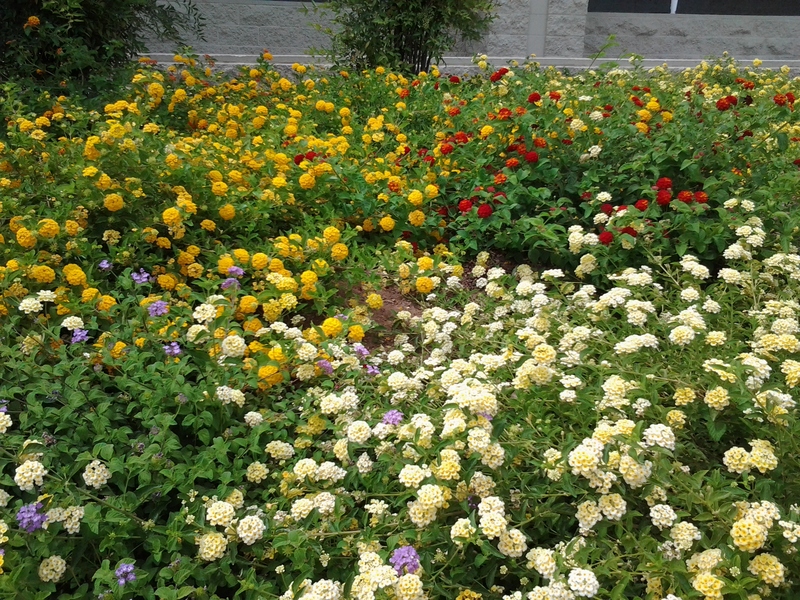 Planting, Growing and Caring for lantana is easy. They like a lot of sun and lantana is not picky about their soil. Half of our garden lantana are growing in pots and containers, the other half is in the ground by cacti. We do water the potted lantana once a day when the temperature is high. Last week we reached 110 degrees and my pots / planters needed a small amount of water in the morning and then in the evening. This is unusual and was due to the bone dry heat. Lantana stems are HOLLOW so overwatering will cause your lantana roots to rot. Try NOT to prune or trim your lantana until the end of the season. Remember the lantana stems are hollow. On average, the ground lantana need a DEEP soaking twice a week. A good indicator is the leaves. If your lantana is wilting, then water but be careful NOT to get water on the leaves. Most of the lantana we have planted are in full sun. Watering at the roots prevents the risk of burning the leaves. I have planted a couple varieties of Lantana in my yard near Phoenix. I have planted late, yes, but I figured as long as I watered it and kept the dirt moist, then the Lantana should survive. Nope! As soon as the mid-day sun hits it, it’s a goner…like instantly, even though the ground and roots are moist! Is anyone experiencing this? Also, on a side note, it seem the “Dallas Red” cultivar is taking the heat better than “Radiation” or “Yellow Gold”. So far, even when newly planted on a south-facing yard, it has survived. Personally, I think the Phoenix sun is not as forgiving as your Tucson sun, but perhaps you could lend some advice. Thanks! Tony this year has been so hard for our plants. The heat has been extremely intense and it seems many of our plants including our lantana are barely surviving. Thanks for pointing out the Dallas Red cultivar. Next year we will plant that one. Our “Purple Trailing” is not doing well. We’ve talked and can’t remember the plants having such a hard time before. The sun is different this year. On an up note – our Marigolds, Yarrow, Aloe Vera and Pomegranate Trees are thriving! Forgive me if I’m wrong but isn’t Lantana a weed? You are correct for some areas such as Florida. In the hot desert it is easier to control the lantana and therefore it is not considered invasive. 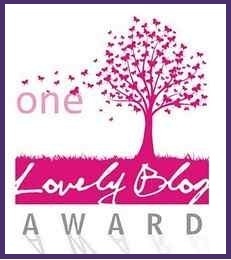 Thank you for the great comment! I think I’ll try some lantana in my yard. The summer heat seems to wilt everything else. This is how I discovered your site: researching my own lantana, which is thriving in my West Texas yard. It has proven the solution to a couple of previously very UGLY spots. And now I know a bit more about how to prune it and water it. Thanks. 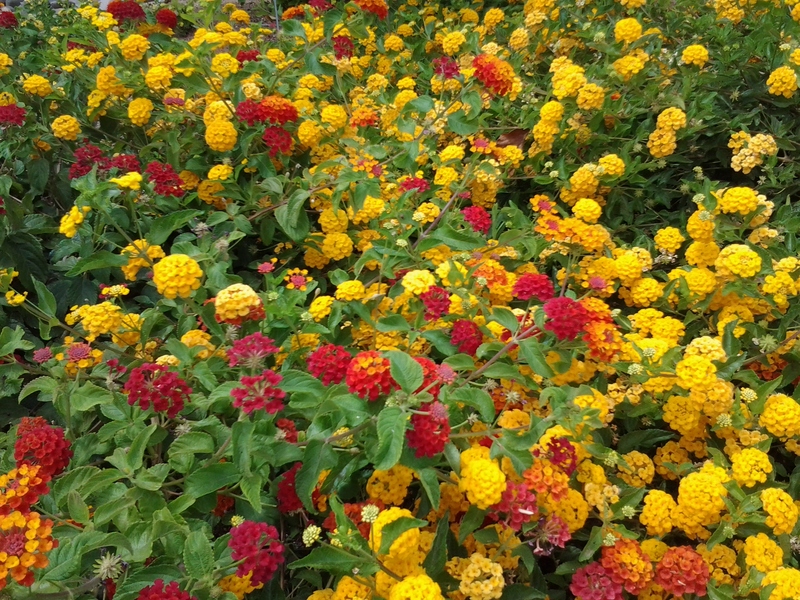 Yes, I agree with you that the lantana can be quite beautiful especially when grown en masse. Sadly, it has long been declared as one of the top weeds in Australia due to its having considerable negative impacts on native species and ecosystems. Thank you Jalal for the positive words and the visit. Pomegranate is #1 in our TOP 10 Heat Resistant Plants! Fun cat quotes and pictures! Sage bushes with Purple Flowers bring life to the desert!